Invisalign has been the top choice for years for both adults and teens who want a straighter smile. It makes sense! Invisalign is discrete, super effective, and fast. On average, Invisalign treatment time is 12 to 18 months, though many people see noticeable changes almost right away. 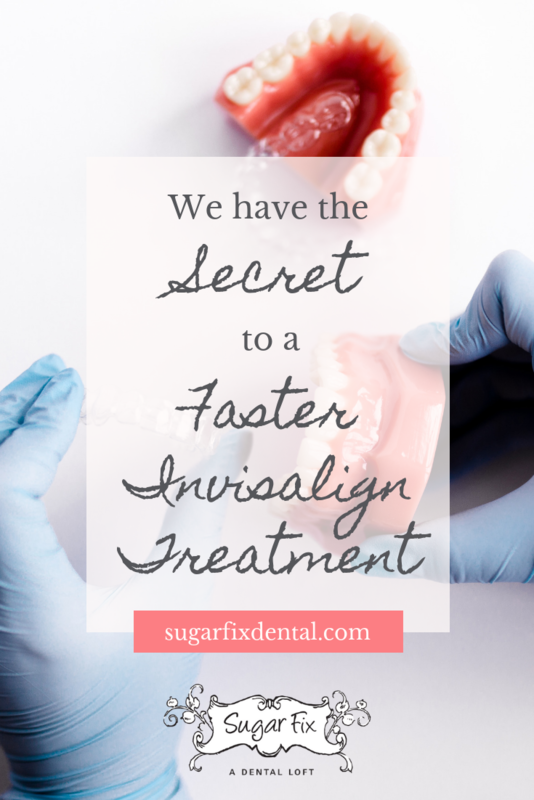 Even still, many people want to know if there’s a faster Invisalign treatment option out there. We’re so happy to say there is! By incorporating a new technology called Propel VPro5 with your Invisalign treatment, you can reduce your treatment time by up to 50%… seriously! Propel VPro5 is an innovative device that stimulates the bone surrounding the teeth to help your teeth shift more easily. It also helps to increase blood flow and tissue regrowth to strengthen the bones and help the affected tissues heal faster… even after your Invisalign treatment is over. As your teeth shift into alignment, the bone that holds your teeth in place can adjust more easily to your new, straighter smile. Propel VPro5 is almost entirely painless, and it only takes only a few minutes to complete. It’s perfect for adults, since their bones have generally stopped shifting, but it is also great for teens and pre-teens, whose bones are still growing. The first thing we’ll do to get you ready for your Invisalign treatment is to come up with a digital plan that’s perfectly tailored to you. We’ll use our 3D iTero scanner to get digital images of your teeth so we can create aligner trays that work with your mouth and address your most pressing issues. Once we have your custom aligners all ready for you, we’ll give you a schedule to follow. Without Propel VPro5, you will most likely be wearing each aligner tray for 1 to 2 weeks for 20 to 22 hours a day. However, a faster Invisalign treatment is possible. With the Propel VPro5, you can move through your trays much more quickly, shortening not only the time between trays but also the overall time you’ll be wearing Invisalign clear braces. Are you interested in combining Invisalign and Propel VPro5 to get a perfectly straight smile in just a few months? We’d love to help you! Just give us a call at (773) 883-1818 to schedule a consultation. At Sugar Fix Dental Loft, we offer a full array of cosmetic dentistry services in addition to Invisalign, including same day crowns, porcelain veneers, and sedation dentistry. We’re taking new patients and would love to meet you!